During World war Two Carrots were in plentiful supply and were used in several wartim e ‘mock’ recipes like Carrolade and carrot jam. 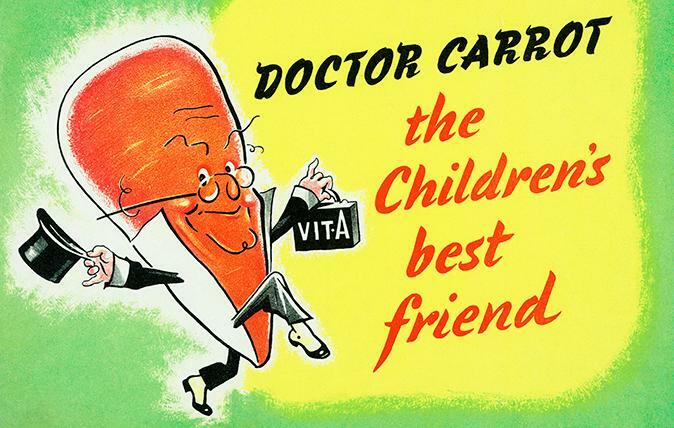 The Ministry of Food even developed a cartoon character called Dr Carrot, who carried a vitamin A doctor’s bag, as part of their campaign to encourage healthy eating during rationing. Government propaganda suggested that beta-carotene (or vitamin A) which helps night vision was responsible for the RAFs increasing success in shooting down enemy bombers. People eagerly tucked into carrots - this not only made good use of the surplus vegetable but also helped mask the real reason for the RAFs success - the improvement in on-board radar technology. Carrolade - During World War Two the government instigated a massive publicity campaign to educate people about coping with food shortages and advising on suitable alternatives. 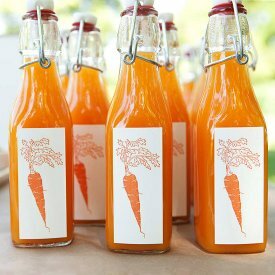 A homemade drink called Carrolade was invented, made up from the juices of carrots and Swede (Rutabaga) grated and squeezed through a piece of muslin, clearly no one thought of just plain carrot juice! Visit Carrots in World War Two here. 1. In a medium saucepan combine carrots and water. Bring to boiling; reduce heat and cover. Simmer for 30 minutes or until very tender. Cool slightly; transfer mixture to a blender. Add 1 cup of the pineapple juice. Cover and blend until smooth. 3. Serve over ice with lemon wedges. Important note: refrigerate this drink as soon as possible and do not keep over a week. Carrot juice/lemonade does not keep well. Do make sure that you are strictly careful with your preparation and follow good hygiene standards, to minimise the risk of food poisoning. The Small Print! -Carrot juice, like other low acid products, must be kept refrigerated to ensure product safety. Properly refrigerated carrot juice poses no risk to consumer health. However, all fresh carrot juice (regardless of manufacturer or brand) has the potential to harbour Botulism if improperly refrigerated or exposed to elevated temperatures for extended periods of time. Teaching Note: When you want to blend hot mixtures in a blender or food processor, cool the mixture before blending. Cooling prevents steam from building up in the blender (which could cause hot liquid to spurt out the top of the blender). Teaching Note: Packed with vitamin A and C, this is a great summertime drink to have on hand. Make a double batch and store in the refrigerator up to 1 week.